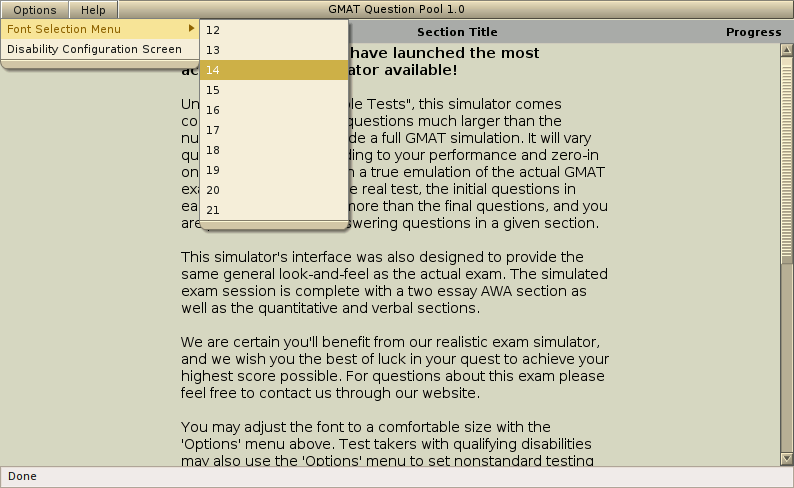 GMAT Exam Simulator for evaluating preparedness levels. Supplement your preparation materials and practice quantitative, verbal, and AWA sections with realistic sample questions including the new question types (bold-faced critical reasoning questions & tougher probability questions) - free demo. Complete with answers, explanations, and accurate scoring assessment. Qweas is providing links to GMAT Exam Simulator 4.0.0 as a courtesy, and makes no representations regarding GMAT Exam Simulator or any other applications or any information related thereto. Any questions, complaints or claims regarding this application GMAT Exam Simulator 4.0.0 must be directed to the appropriate software vendor. You may click the publisher link of GMAT Exam Simulator on the top of this page to get more details about the vendor.